"I swore an oath to avenge the death of my father. I may be half a man, but I swore a whole oath." Prince Yarvi has vowed to regain a throne he never wanted. But first he must survive cruelty, chains, and the bitter waters of the Shattered Sea. And he must do it all with only one good hand. The deceived will become the deceiver. Born a weakling in the eyes of his father, Yarvi is alone in a world where a strong arm and a cold heart rule. He cannot grip a shield or swing an axe, so he must sharpen his mind to a deadly edge. The betrayed will become the betrayer. Gathering a strange fellowship of the outcast and the lost, he finds they can do more to help him become the man he needs to be than any court of nobles could. Will the usurped become the usurper? 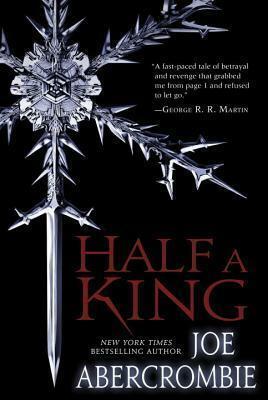 Joe Abercrombie is the New York Times bestselling author of Red Country and the First Law trilogy: The Blade Itself, Before They Are Hanged, and Last Argument of Kings. He spent ten years as a freelance film editor, but is now a full-time writer who lives in Bath, England, with his wife, two daughters, and son.